The Christmas Social evening took the Club to the halfway point of its 60th Season under the moniker of Falkirk Camera Club. A night of Quizzes, Christmas Bingo and Charades with prizes and an ever popular Buffet was enjoyed in a packed hall. Joan Clarke guided everyone through an evening on which she had worked so energetically to prepare. Behind the scenes both Agnes Clark and Bob Black had played crucial roles to make it all happen while after the event Steve Sommerville led a team who prepared the hall for the next lecture in January. The Club has seen the work of some outstanding photographers during the past few months. Early in the season, the innovative aerial photography of James Gentles was a fascinating look at photography from the sky. He was followed by etherial images of Iona by Barbara Sellars who demonstrated how photographs can be a means of self expression yet communicate to all at the same time. David Sadler’s exuberant photography from Skateboards and Rooftops then resulted in a terrific evening which will be difficult to emulate but which we hope he will repeat in the future. Professional Sports Photographer Rob Hardie made a memorable visit to Falkirk in November. Rob’s skill at capturing key moments of sporting prowess from crunching tackles on the Rugby field to the telepathic anticipation of players at the Cricket ground together with all the other sports which he covers resulted in an inspiring evening. Also during the past few months Monthly Club Competitions, our annual joint evening with Stirling & District C.C., participation in the Central Scotland 5 Way Competition and the Scottish Photographic Federation Digital Championships kept everyone busy. 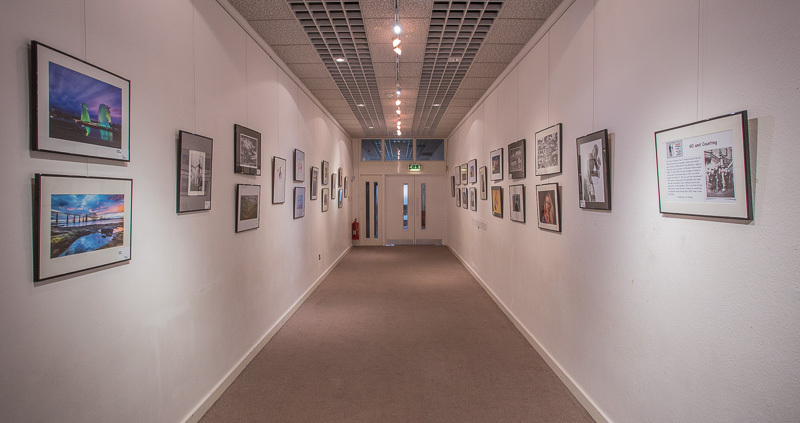 The Club’s annual exhibition in Falkirk Town Hall opened in November and closes just before Christmas and is a reminder of the range of subjects which interest Club photographers. One of the most memorable events of the past few months was on 14th October when present day members gathered to be photographed at Callendar House, Falkirk, on the same spot where the first group of amateur photographers in the town had stood over 120 years ago. 2018 will bring the second half of this Diamond Anniversary season under the name of Falkirk C.C. Steven Cosh opens the new year sessions on 11th January with a talk on Street Photography. Three From Six is a new event in the Syllabus where Club members are asked to submit photographs by 18th January which convey a theme, rather than a specific subject. The Club will participate in the Scottish Photographic Federation Print Championships in February then we join our friends from Kirkintilloch C.C and Stirling & District C.C. for the Williamson Trophy competition in March. The Astronomical photography of Douglas Cooper will be featured later that month when we also hold our annual joint evening with Falkirk Writers Circle. During April the Club will hold an exhibition in Callendar House, Falkirk, which promises to be a tremendously exciting event. It only remains to wish you & yours a very Merry Christmas, a Happy New Year, and a peaceful and healthy 2018. Take Care. The annual Falkirk Town Hall Picture Exhibition started on Saturday the 4th November and runs to 22nd December, 10am -4pm Mon to Friday. 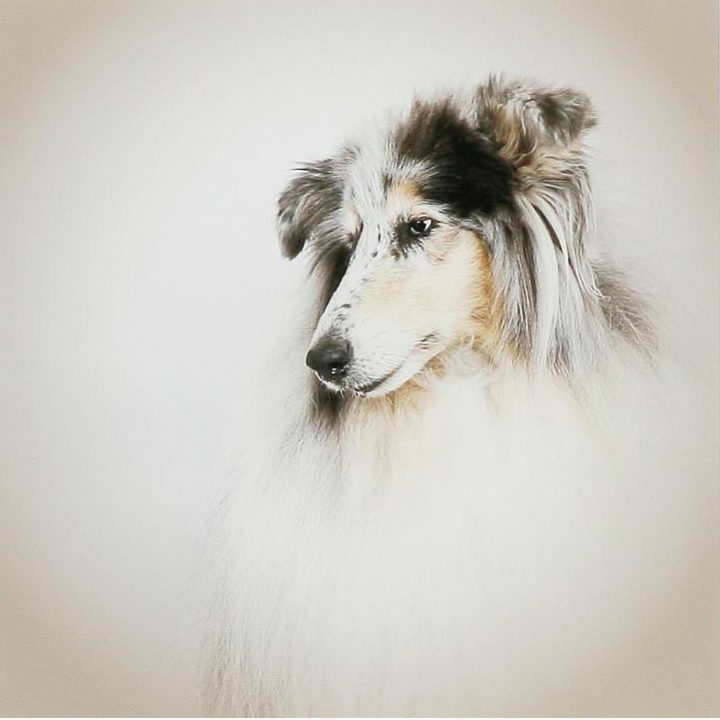 Congratulations to Eileen Sutherland, FCC, on winning Best Portrait Print at the SPF Championships with her image titled “Ziggy”. Thursday 26th Nov, 2015, FCC hosted the “Five Way” competition in which five local camera clubs compete for a coveted trophy. 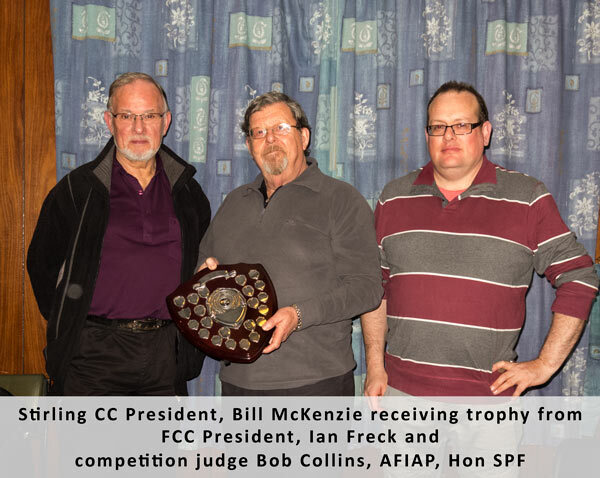 The 2015 winners were Stirling CC with 175 points, followed in order by Falkirk CC, Airdrie & Coatbridge Photographic Club, Kirkintilloch CC, Cumbernauld & Kilsyth Photographic Soc. Although FCC came second in the overall competition they topped all in the PDI section. Unfortunately points from both prints and PDI together determine the overall winner. Congratulation to Stirling CC members on their win, and thanks to the other clubs for their participation. The competition was judged by Bob Collins, AFIAP, Hon SPF, a member of Queens Park CC, and our thanks to him for his time in judging and providing a critique on each image.